I love the name of this meal. Le Grand Aioli! It sounds so important. 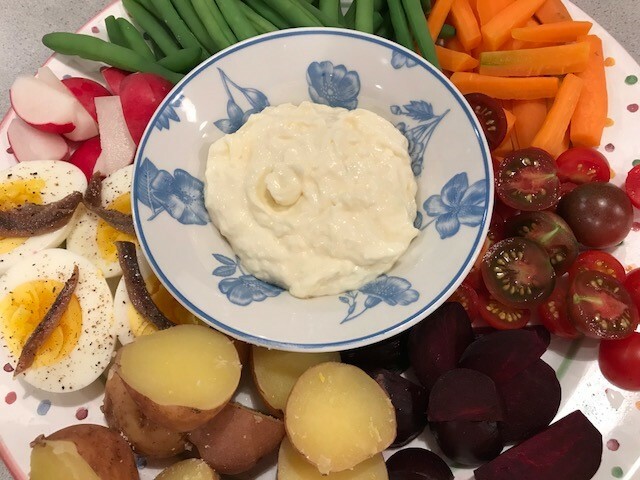 In actuality, it’s a somewhat humble feast of seasonal vegetables, hard-boiled eggs, and sometimes fish, that accompany the star of the show, the garlicky mayonnaise known as aioli. I’ve made this a few times in the past. It’s the perfect meal for the peak of summer when produce is at its very best. When it came up as the weekly challenge recipe for Cook the Book Fridays I was fully on board. Because I’m lazy, I was making aioli in the food processor. I chopped the garlic and add the egg yolk and salt. Then, I slowly drizzled in the oil and… nothing happened. It did NOT emulsify. I tried two “fixes” that the Internet recommends. First adding another egg yolk, then adding some commercial mayonnaise. It didn’t even thicken; never mind the emulsification I was expecting. Frustrated, I dumped le grand failure and simply minced more garlic and stirred it into commercial mayonnaise thinned with lemon juice. Not as good as homemade, but certainly guaranteed success! My accompaniments were from my backyard garden or local farms, my favorite kind of summer meal. Cherry tomatoes and green beans that I grew myself! 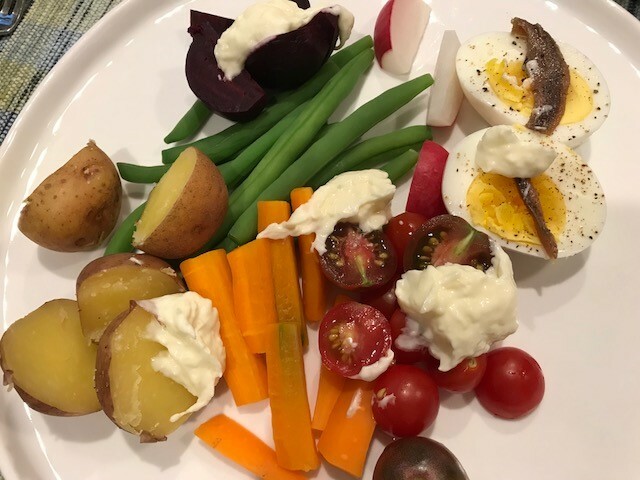 Carrots, potatoes, beets, and eggs from local farms. I love beets, though not raw, so I roasted the beets. I didn’t include any fish (or chicken), feeling that the eggs draped with anchovy were enough choice for our meal for two. Le Grand Aioli is the perfect showcase for the summer’s latest yield. I’ve only made this in the summer but could imagine a similarly enticing platter with roasted winter squash and some other root vegetables as fall arrives. You should try this before summer ends. The recipe can be found on page 145 of David Lebovitz’s My Paris Kitchen. Other reviews of this recipe from my friends from Cook the Book Fridays can be found here. It seems like the weather on the first day of September is always cool and crisp. It’s technically still summer, but it’s as if autumn pops its head up to say “Hi! Missed me? I’m coming soon!” A taste of autumn for a day or two, then summer resumes its place for the duration. 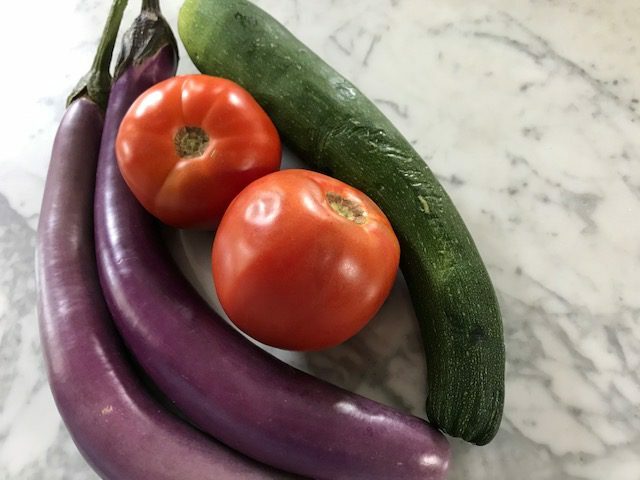 Produce-wise, it’s the peak of summer vegetables. Tomatoes, corn, zucchini abound. It’s one of my favorite times of year for eating. This week’s recipe for Cook the Book Fridays fit right into the “peak of summer” theme. 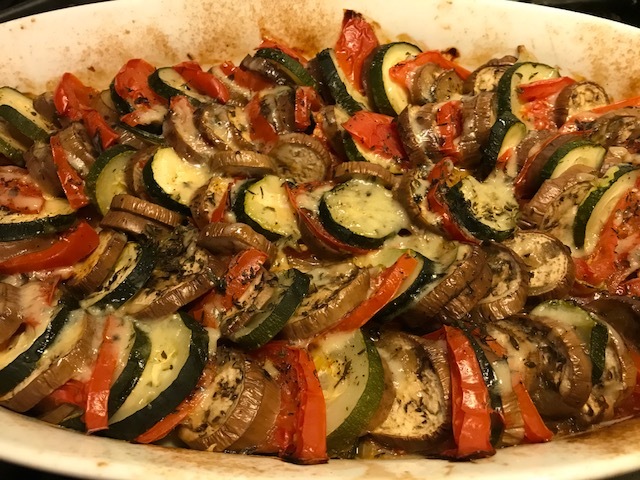 Baked Provençal Vegetables aka Tian was the order of the day. Sautéed onions and garlic for the bed for an arrangement of thinly sliced zucchini (home grown! ), eggplant, and tomatoes sprinkled with thyme and handful of Gruyère cheese. 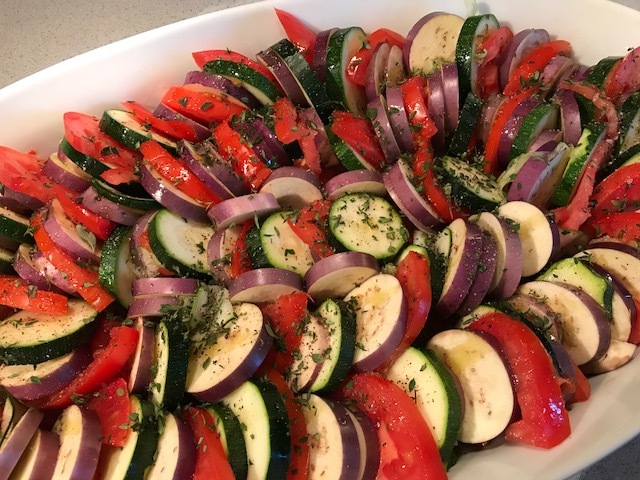 The ingredients resemble those ratatouille, but the technique, baking instead of simmering stovetop, makes a tian so much easier to prepare. 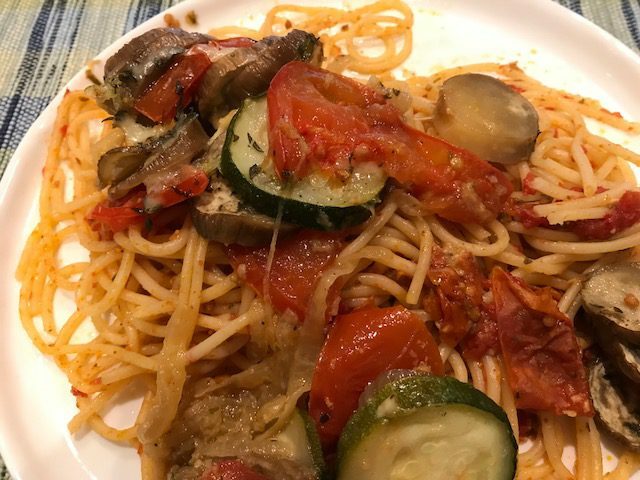 I served the meltingly tender vegetables atop leftover spaghetti. It was delicious. What’s not to like? Well, that assumes you’re a fan of zucchini and eggplant, which Howard is not. Obviously, I was solo for dinner the night I made this. If you’d like the recipe, you’ll find it on page 226 of David Lebovitz’s My Paris Kitchen. This recipe from Saveur is also very similar. You can also find the reviews of my Cook the Book Fridays friends here.